At first glance Atlantic Airways has the perfect life: it is majority state owned and it has no competition in its home market. It is the sole airline providing air service to and from the Faroe Islands since now defunct Maersk Air stopped serving the country in 2004. However, a deeper look into the small Faroese carrier’s operations quickly reveals that its situation is not enviable; it is quite the opposite, as it operates in an extremely challenging environment that includes a mountainous topography allowing only narrow and offset approach paths, extreme seasonality and the prevailing volatile North Atlantic weather. Cancellations or diversions due to the low cloud base, unfavourable winds or snowfall can cause knock-on disruptions for days at a time as the nearest alternates to Vágar Airport, the airline’s base, are in Iceland, Scotland or Norway. Irregular operations are a financial burden on Atlantic Airways. The airline has to incur considerable costs for passenger care in various European countries under the European Union’s strict air passenger rights regulation 261/2004, which requires compensation and/or assistance to passengers in case of denied boarding, downgrading, cancellation or long flight delays. Additionally, Atlantic Airways is punished by high airport charges at Vágar Airport for late or early landings and take-offs when seeking to re-establish normal traffic. In 2011, the cost related to adverse weather, delays, cancellations and diversions was around DKK9 million (EUR1.2 million) on revenue of DKK435.5 million (EUR58.4 million). To enhance the approach and departure performance at Vágar Airport in adverse weather conditions, Atlantic Airways implemented RNP-AR procedures (Required Navigation Performance with Authorisation Required) when it introduced its first Airbus A319 in Mar-2012. This was a groundbreaking event, not only for the small regional airline, which until then only operated regional aircraft, but also for Europe as Atlantic Airways was the first EASA-certified RNP-AR commercial operator. The airline was established in 1987 shortly after the Faroese government finalised negotiations with the Danish government to allow a Faroese operator to provide air services in competition with Danish operators who previously had monopoly on this service. The Faroe Islands fall under sovereignty of Denmark (although they have a large degree of self-government) and Atlantic Airways falls under the supervision of the Danish Civil Aviation Authority. Operations started in Mar-1988, with a single aircraft and just one route, between the Faroe Islands and Copenhagen. Atlantic Airways has gradually expanded its route network to the neighbouring countries Iceland, Norway and UK and growing traffic at Vágar Airport from around 90,000 passengers to about 200,000 per annum. It has established new income streams, ensuring the company a stable economic base. The main activity consists of scheduled service with the Faroe Islands as a cornerstone providing a year-round lifeline for islanders and bringing tourists to the islands. It also offers charter and wet-lease (ACMI) services in Europe and has helicopter operations in Faroese and North Sea waters. Atlantic Airways’ helicopter fleet is operated for search and rescue, inner-island scheduled flights and to support the offshore oil exploration industry. Scheduled services account for over 80% of the company’s revenue and 74% of passenger numbers. In line with the small size of its home market, Atlantic Airways flies a limited scheduled network comprising less than 10 passenger destinations with a fleet of three BAE Systems Avro RJ 100/85 airliners, of which two are owned and one is leased with the contract ending in Sep-2013, and one brand new A319. Scheduled passenger numbers reached 193,000 in 2011 and were up 4% on 2010. Some of its destinations are served only on a seasonal basis, such as Barcelona. This route was launched in Jun-2012 and ran through Aug-2012 with a once weekly flight. The airline serves three airports in Denmark: Copenhagen Kastrup, Billund and Aalborg. Passenger numbers on Atlantic Airways’ Danish routes represent 90% of total enplanements and increased 3% in 2011 to 174,000 from 168,000 in 2010. Seat load factors on these routes averaged 79% in 2011, an improvement of 3ppt compared with the 76% load factor recorded in 2010. Competition on routes to Denmark comes from ship operator Smyril Line, and Atlantic Airways has cautioned that competition from Smyril Line is expected to be “noticeable” for 2012 as the company lowered their overall prices for campaign purposes in early 2012. Vágar-Copenhagen Kastrup Airport is by far Atlantic Airways’ largest route in terms of capacity with about 4000 weekly seats and 28 frequencies, according to schedules in Innovata for the week of 24-Sep-2012 to 30-Sep-2012. The airline deploys all its capacity in western Europe representing approximately 4900 seats and 38 frequencies, based on schedules in Innovata for the week of 24-Sep-2012 to 30-Sep-2012. Note: FAE = Vágar Airport; CPH = Copenhagen Kastrup Airport; BLL = Billund Airport; RKV = Reykjavik City Airport; NAP = Naples Airport. 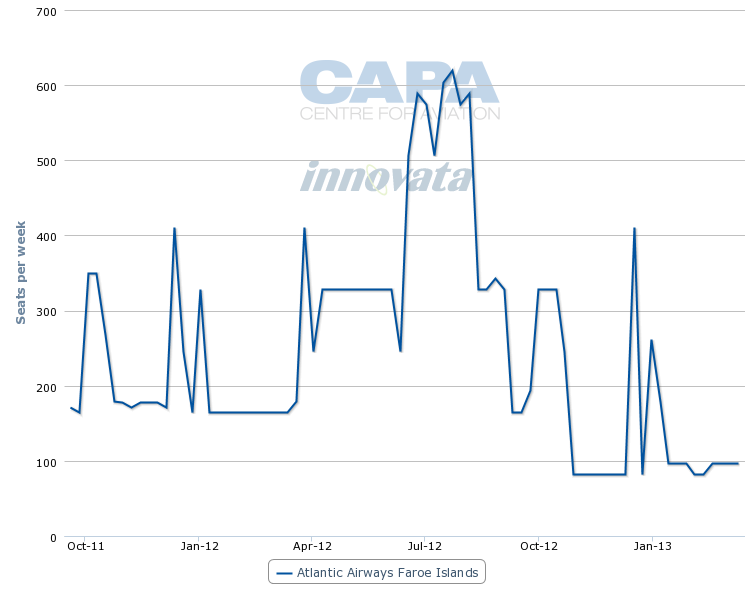 Atlantic Airways suffers from a high seasonality in its scheduled traffic. Frequencies to Danish airports vary from 18 a week during the traditionally low winter season to 40 a week during high season. Even on its largest service, Vágar to Copenhagen, capacity fluctuates from a low peak of about 1100 one-way seats in the week of 26-Dec-2011 to 01-Jan-2012 to a high peak of about 2700 one-way seats in the week of 09-Apr-2012 to 15-Apr-2012, according to schedules in Innovata. Capacity on Atlantic Airways’ route from Vágar to Billund drops from about 600 one-way weekly seats in Jul-2012 to a low of less than 100 one-way weekly seats in Nov-2012. Speaking to CAPA at the European Regions Airlines Association (ERA) general assembly in Dublin on 20-Sep-2012, the airline’s CEO and President Magni Arge recognised it is a challenge to encourage more traffic in the low winter season. In summer, the Faroese people leave the islands to go for holidays and foreign visitors come to the country. “We need to market the Faroe Island destination more, also as a year-round destination. The destination has a lot to offer such as authenticity, sustainability and an untouched natural environment, but we have to accept that this will not happen overnight,” Mr Arge said. He added that Iceland is the company’s text book example how a remote location and unspoiled nature can be optimally marketed, benefitting the national airline and the local economy. Atlantic Airways normally undertakes heavy aircraft maintenance during low season and offers capacity in the ACMI/charter business during the winter. Most of its wet-lease contracts are very short term, varying from one month to a day. Past or present wet-lease customers include British Airways for operations at London City Airport, SAS Scandinavian Airlines, Air Greenland, Malmö Aviation and Blue1. The company has been pursuing ACMI and charter contracts for roughly eight years and it is seeking to expand the segment. “The Faroese home market is relatively small, and the company therefore also has a strategic interest in providing services outside the Faroe Islands based on profitability and relevance to Atlantic Airways’ core competences,” Mr Arge explained. In Mar-2012, Atlantic Airways took delivery of its first Airbus narrowbody aircraft. The introduction of the aircraft type into the carrier’s operation was made possible by the extension of Vágar’s runway to 1,799 metres at the end of 2011. Until then, Atlantic Airways only operated a fleet of BAE 146s and AVRO RJs resulting from the restrictions of the short runway (1,250 metres) and surrounding topography. The A319 provides the airline with new opportunities to develop its range of services and products, according to Mr Arge. He told CAPA in Dublin that “we are able to offer lower costs and a wider range of prices for our main market, scheduled services from and to the Faroe Islands, as the A319 provides us with a lower unit or seat cost. Lower fares will grow the market.” The A319 is configured with 144 seats in a single class lay-out. The longer range of the A319 also gives the carrier the opportunity to offer direct flights to new destinations, such as Barcelona, and enlarges its potential in the charter market. Mr Arge however waved away speculation that Atlantic Airways might launch flights to the US, reasoning that there “might be a gap between what is technically doable and commercially viable”. The airline is, however, considering forging a closer cooperation with Air Iceland and Icelandair. Atlantic Airways currently operates a twice weekly service in winter and a thrice weekly service in summer to Reykjavik Airport in codeshare with Air Iceland. The airline interlines with Icelandair and a next move, Mr Arge indicated, could be to move the flights from Reykjavik Airport, located near the centre of the city, to Keflavik. This would allow Atlantic Airways to plug into Icelandair’s growing North American network “and to advocate inbound tourist traffic from the US as well as outbound”. Despite its cumbersome operating environment and small market, Atlantic Airways has recorded a positive EBIT and net profit in the past five years, except in 2009 when the global economic downturn impacted results. The company posted a full year net profit for 2011 of DKK22.5 million (EUR3 million) compared to DKK12.3 million (EUR1.6 million) in 2010, an improvement of 81%. 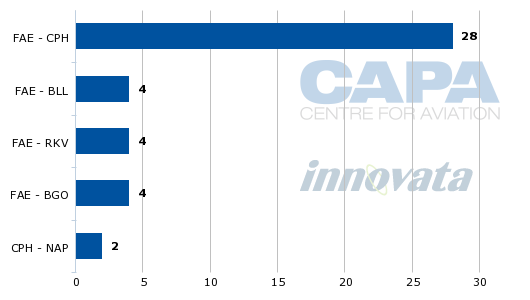 Total revenue rose 8% to DKK435.6 million (EUR58 million) from DKK402.7 million (EUR54 million) in 2010. 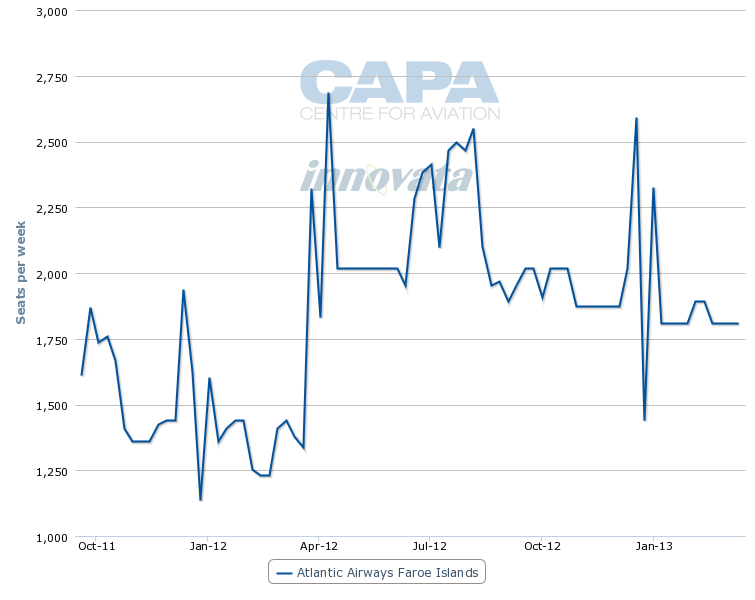 The improved result in 2011 exceeded Atlantic Airways' original financial guidance for 2011. The main drivers were higher utilisation, lower unit costs, improved revenue management and what it described as “a company-wide spirit to create a more cost-efficient basis for our airline”. Atlantic Airways launched turn-around initiatives in the wake of the difficult year of 2009. Net profit for 1H2012 came in at DKK1.4 million (EUR188,311), down 82.1% compared to 1H2011 on a year-on-year 5.6% growth in revenue to DKK214.7 million (EUR28.9 million). Scheduled passenger numbers rose 3.7% to 90,923 but scheduled load factor lost 5ppts to 72%. The company said it remained “cautious” in its full-year guidance and expects a financial performance in 2012 to be closer to the 2010 levels rather than 2011. Atlantic Airways was established to develop the Faroese airline industry and airline services, and the company has fared extremely well. It has grown from a small company with one aircraft and limited capabilities to a company which posts healthy profits, operates several aircraft and pioneered the technically challenging satellite-based RNP-AR navigation system in Europe. Atlantic Airways is the vivid testimony that regional airlines can be at the forefront of aviation and do fulfill a fundamental role in the economy of remote regions in Europe.